Certificates recognize students who have achieved a level of proficiency or specialization in a particular area or subject. The Certificate in Animal Welfare aims to help students gain specialized knowledge on the well-being of animals managed ethically by humans. The certificate provides a range of theory, evaluation of scientific literature, and its application surrounding the use of animals. This program prepares students for careers in animal health and welfare by giving them expertise specific to this field. 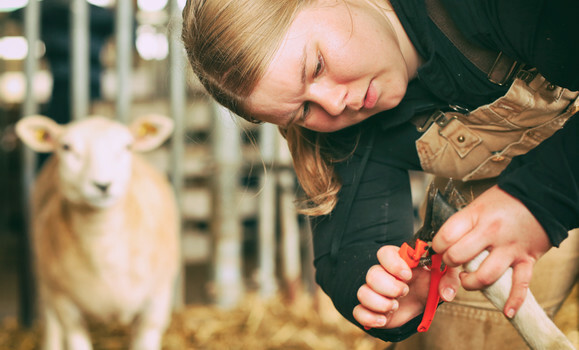 In completing five courses as part of this certificate program, students will understand ethical concepts surrounding animal use and will develop the skills required to assess specific situations and make sound recommendations for improvements in livestock care, handling, transportation and slaughter. As well, students will observe, measure and document a variety of animal behaviors by working hands-on in our Ruminant Animal Centre. This certificate is open to students eligible for admission to or enrolled in a BSc or BSc (Agr) program at either of Dalhousie’s Halifax or Truro campuses. Total of 15 credit hours required to be completed within 5 years (maximum). To inquire further about the requirements for the Certificate in Animal Welfare, please contact Program Coordinator, Miriam Gordon (miriam.gordon@dal.ca).